When I was at an open day at Salt Meat Cheese recently I met Rowena Firth . I started talking to her over a glass of wine and some wonderful cheeses. She was a lot of fun and after a while I asked her what she did and she told me that she is a Selmelier. Yes, you thought I spelt that wrong didn’t you?. That’s right she is a salt expert. She has a bit of a wandering spirit much like I do and during a stint living in the US she became interested in salt. So, back to Rowena and her new job as a “Semmelier”. She knows a lot about salt and she imports all kinds of salts; gourmet cooking salts, and lifestyle salts like bathsalts and “salt gifts”-such as storage & servers. We did a bit of a tour of the salt section at Salt Meats Cheese looking at the bags of salt. 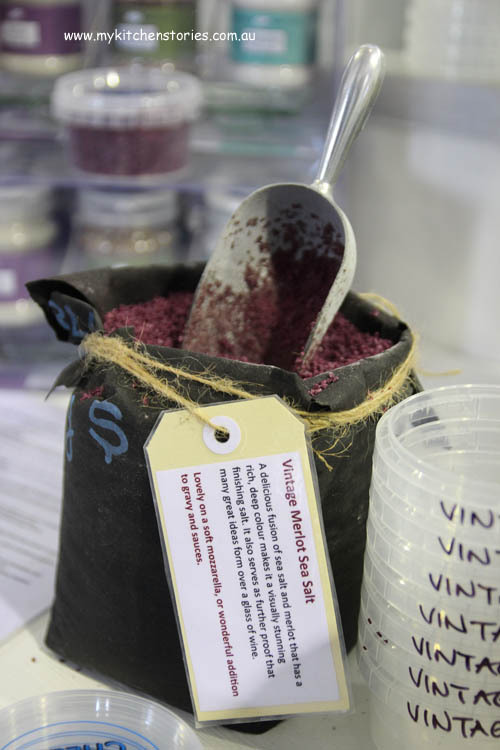 She brings in all kinds of exciting flavours from around the world and sells them wholesale and on her website The Salt Box. How about Merlot, Balsamic or Espresso salt or maybe Habanero, Rosemary or Porcini? I’ve got a container of her Yakima Applewood Smoked Salt from Washington State in the USA. 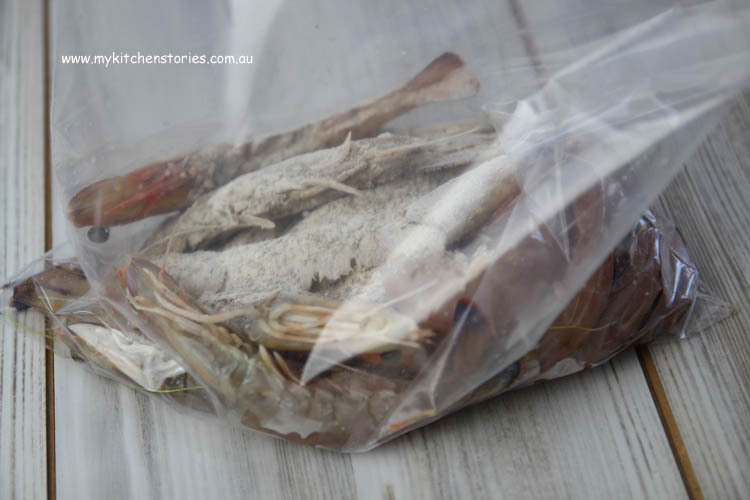 I made some whole Smoked Salt and Pepper Prawns with it but you could use this recipe for squid or chicken if you like . 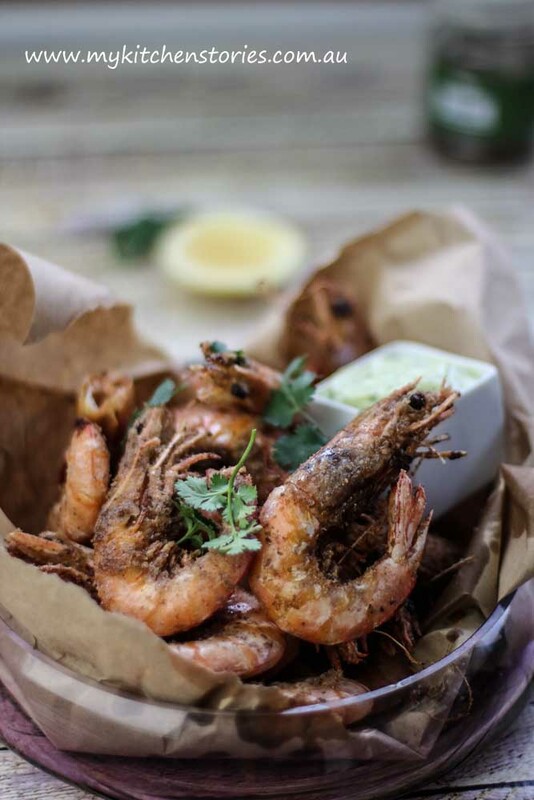 These crunchy salt and pepper prawns can be eaten shell and all. 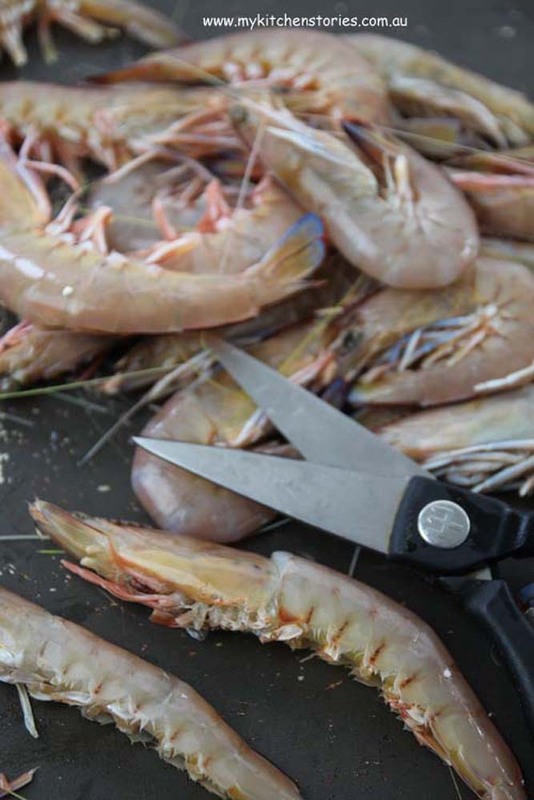 Cut the legs and spikey bits from the Prawns with scissors. Mix the spices and put them into a plastic zip top bag. 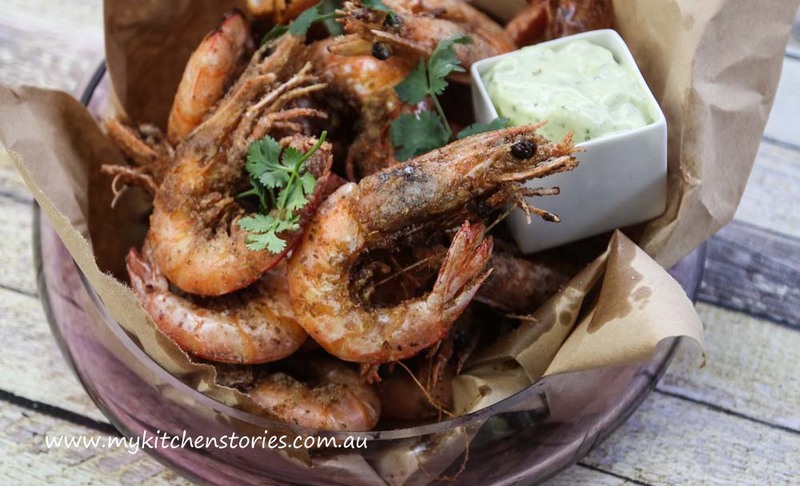 Add the Prawns and shake. Set aside in the fridge. Put the egg yolk, dijon, juice and zest into a blender or processor. Blitz till combined and creamy. Slowly add the oil with the blender going until the mayonnaise is thick. 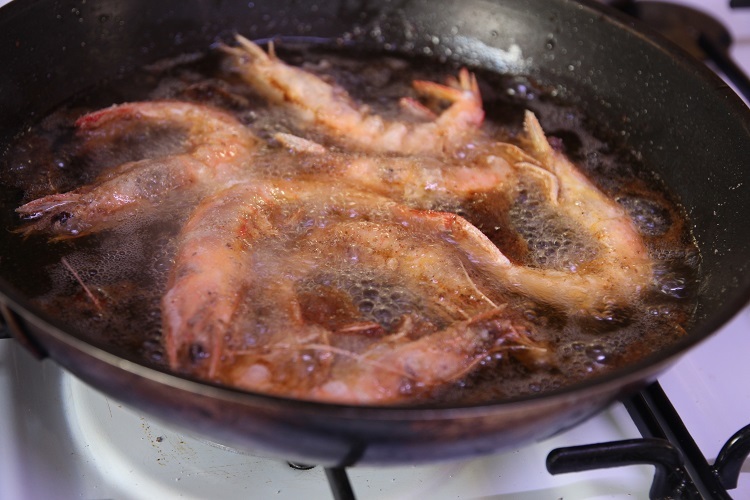 If the mixture is still thin when all the oil is added add a little more. Season with smoked salt and pepper and a little more lime juice. Put the oil into a deep pot and heat to around 180C/350 F or until a piece of bread dropped into the oil sizzles. 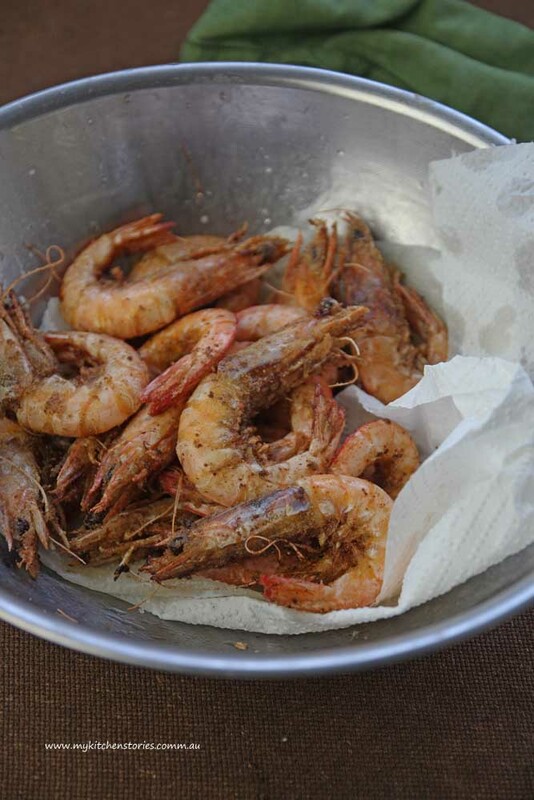 Add the prawns a few at a time cooking for approx 8 minutes or until starting to colour. The shell should be crispy and the inside moist. Test one. Have you met anyone with an interesting job lately? These look so delish! 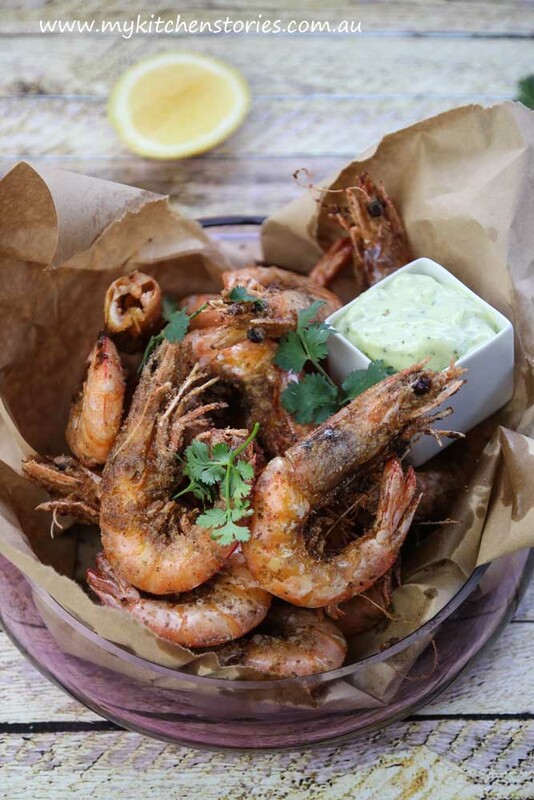 And such a great idea to use smoked salt too. I didn’t think you’d misspelled the word as much as I thought it was a title I knew nothing about. I wish I didn’t have to restrict salt in my diet but it does make a difference with the vertigo. Maybe there’s a salt that wouldn’t be as bad? Is it bad that I could eat good salt on its own? 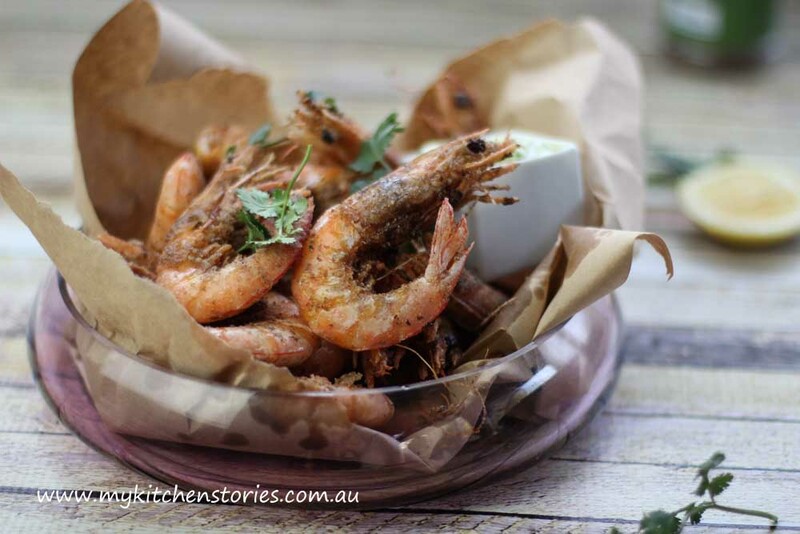 Ok I’ll eat it with your prawns to balance it out. 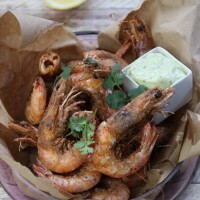 One of my favorite ways to prepare prawns!